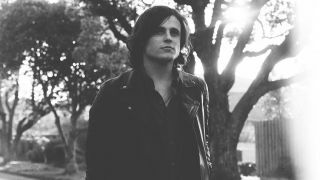 23-year-old Australian singer-songwriter and blues-rock virtuoso Hamish Anderson has been having a banner year in 2015. His recently released sophomore EP, Restless, has been drawing rave reviews from the guitar press, and no less than Gary Clark Jr singled him out on Revolt TV as one of the 'guitar players under 30' that music fans should watch. But will Anderson fold when MusicRadar poses to him our famous "10 Questions With…"? Let's see if he shreds or shrinks. Hamish Anderson's EP Restless can be purchased on Amazon and iTunes. "It was an Ibanez. I'm not sure which model it was, but it was the first guitar my parents got me. It was a cheap, secondhand thing, my starter guitar. The first guitar I really found my sound on was my Fender Strat, which I still play today." 2. The building's burning down: What one guitar from your collection would you save? "I've got a '52 Tele reissue that's pretty sweet - it's sort of the main guitar I use. That would probably be the one I'd run in to save. Of course, I'd have to think about whether I'd run into a burning building at all. [Laughs] It's kind of like the BB King Lucille situation, isn't it? The story goes that he ran into a burning building to save that one. If the flames weren't too crazy, I might think about it." "That would be the '52 Tele, for sure. But back in Australia, I've got a really nice 1959 Les Paul sunburst, which I'm regretting not bringing over here to America. I got it two or three years ago as a present from quite a few people, kind of a graduation gift. I'm very lucky to have it. I'm very paranoid about taking it anywhere, especially with the crazy stuff that goes on with airlines, breaking guitars and losing gear and what not." 4. What song would you play on acoustic round the campfire? "Hmm, that's a good one. I'm not sure whose song it is, but I saw a bit with Keith Richards playing something called Spanish Ladies - it was in that Stones movie Shine A Light. It's a really pretty Spanish piece. I think it might be a traditional song, but when I heard Keith play it, I thought, 'Wow, that's really pretty.' It sounds very campfire-esque." "I just got back from Canada as part of a tour, so it would have been right before that. I've really been getting into Peter Green-era Fleetwood Mac, so it would probably have been one of their songs. I've been playing Albatross a lot - it was probably that one. I don't sit down and practise per se; just doing gigs feels like practise to me." 6. Is there a guitar you regret letting go? "No, not really. I let the Ibanez go to get the Strat, but I think I made the right decision there, although a little part of me is sad that I didn't keep my first guitar - sentimental reasons and stuff. But no, I've never sold anything really valuable." 7. When did you last change your own strings? "I changed them pretty recently. In Canada, I was playing heavier gauge strings - 11s and 12s. I've come down again, back to 10s, which feels much better. But yeah, it was in Canada." 8. What advice would you give your younger self about the guitar if you had the chance? "Well, that's not too long ago, luckily. I think I would have told myself to play more slide. I'm really getting into slide guitar recently, and I wish I would have gotten ahead of the curve on that one. I liked slide guitar, but I was too timid to really try it out; it seemed so different, with the pitching and all that. I'm getting pretty good at it and I'm introducing it in my live set. But yeah, it would've been good to have started a bit earlier." "That changes all the time. I generally get pretty nervous before I go on stage, so I'm probably sitting backstage feeling like I'm gonna puke. [Laughs] Beyond that, I'm sitting there listening to music - B.B. King or Buddy Guy - trying to get in the right mood." 10. …And five minutes after? "Having a celebratory beer - that's always a good post-show moment. If it was a good gig, I'm usually buzzing about it and feeling good."